In Germany, and by extension across the whole EU, the battle for banana ‘concepts’ is at its fiercest since Lidl announced in 2018 that it was changing its 100 per cent Rainforest Alliance strategy to 100 per cent Fairtrade across Europe. Meanwhile, Aldi has brought together its two companies (North and South) to buy bananas in a single annual contract for the more than 20 countries in which it has stores. The company made headlines in October 2018 when it became known that it was cutting “at least 50 euro cents” off the (already low) price it expected suppliers to accept for its 2019 contract. The effects are currently being felt by workers in the plantations of supplier countries like Costa Rica, where even greater upward pressure on productivity and downward pressure on wages are becoming intolerable. German minister of economic development and cooperation Gerd Mueller denounced the company’s behaviour, comparing Aldi’s move with Lidl’s shift in the opposite direction. 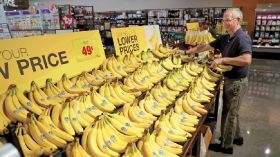 As a fellow member of the World Banana Forum, Aldi is under pressure from the whole industry to review its purchasing practices ahead of new contract negotiations. Meanwhile in the UK, Europe’s second-biggest banana market, Asda’s attempt to buy Sainsbury’s looks unlikely to proceed. Between them, the two would have controlled one-third of the UK’s grocery market. In order to keep pace with Asda, Sainsbury’s has been losing money on every box of loose bananas sold since 2012, selling Fairtrade-labelled fruit at well below the cost of purchase, a practice not allowed in most of Europe. Aldi and Lidl have taken market share from the “big four”, their hard discount model now occupying fourth place behind Tesco, Sainsbury’s and Asda, ahead of Morrisons. In France, consumer prices have remained much higher, leaving more room for manoeuvre when it comes to a fairer distribution of value along the chain. Carrefour, with stores in 30 countries on five continents, is now rolling out a far more visionary strategy, with around one-third of its sales coming from organic and Fairtrade. It is leading a process of agro-ecological conversion with all its international suppliers. By 2022, all the group’s banana suppliers will need to produce credible conversion plans, including radical agrochemical reduction, with technical support from the world’s leading tropical fruit research institution, Cirad. By introducing bananas produced in ‘polyculture’ systems developed by small farmers in South America, retailers Carrefour and Morrisons are showing the way. ‘Polyculture’ means producing ecological bananas in combination with cocoa, citrus, other tropical fruits, tree crops and even livestock in some small farms. Big tropical fruit companies like Chiquita and Compagnie Fruitière have started to explore the role they will play as global citizens in contributing to household food security in both cities and rural areas, alongside the tens of millions of smallholders who depend on bananas and plantains. This more inclusive vision, beyond large-scale monoculture for the markets of richer countries, represents a real shift as debates about feeding mega-cities like Kinshasa, Lagos or Cairo gather pace. Could it be that we are on the brink of real systemic change in this most emblematic of globalised industries? Could 2020 see a real “race to the top” emerging at last?